As soon as summer comes around I ditch the heavy foundations and opt for a lighter base. This generally makes my skin feel like it can breath a little more and makes me feel less sticky and hot throughout the day. I've recently been absolutely loving the Laura Mercier Smooth Finish Flawless Finish Foundation because it's gives a good amount of coverage but feels so lightweight and natural, which is exactly what you want in the summer. Another light foundation I love is the Charlotte Tilbury Light Wonder Foundation as again this is so light (as the name suggests) but also gives the most beautiful glow to the skin. This definitely isn't a matte foundation but I would recommend this if you love glowing and luminous skin. 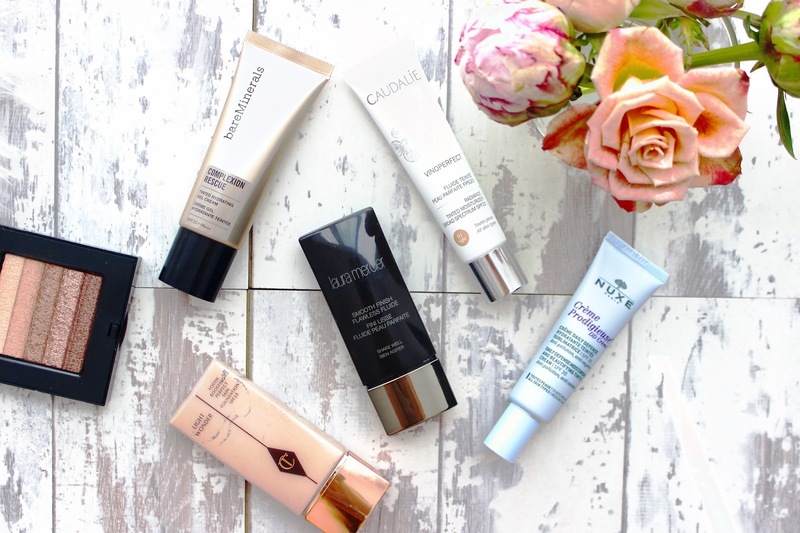 Moving on to super light products that are more correcting with a tiny bit of coverage. I have been using the Nuxe DD Cream all month under my foundation as it warms up my skin really beautifully but also contains SPF 30 so is perfect for the summer. I can also see this product working really well on holiday because it gives a tiny amount of coverage. A product similar to this is the Caudlie Vinoperfect Radiance Tinted Moisturiser as is gives a tiny bit of coverage whilst also protecting with SPF20. I would recommend only getting the light shade in this though unless you do have darker skin as the dark shade is really very dark. If you look for a uber light base in the summer then the only product you will need is the BareMinerals Complexion Rescue Tinted Hydration Gel. This is an incredibly light base that looks like your skin but better. It's almost meant to increase your skins hydration but 215% in one week. I really want to try the Nuxe DD cream now it sounds wonderful!